Charges of Felony DUI, DUI Serious Bodily Injury or DUI Manslaughter are serious charges that require an experienced Palm Beach County DUI Lawyer at your side. The attorneys at the Law Offices of Whittel & Melton are former prosecutors who have handled hundreds of DUI cases, and many times, can anticipate what the prosecutor's next move is-- even before they do. Our attorneys are dedicated to not only defending our client's liberty--we will fight Florida driver's license suspensions that are part in parcel with a DUI arrest. 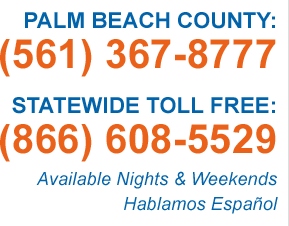 If you are charged with a DUI in West Palm Beach, Boca Raton or Delray Beach our attorneys are here to assist you. Under Florida law, felony DUI is handled differently than misdemeanor DUI. For example, if you have been charged with DUI and there was an accident that resulted in Serious Bodily Injury or a death, you can be subjected to mandatory prison time. This is even if you have never had any other criminal convictions. This is a very different case from a misdemeanor, where a first DUI may merely result in probation and fines. In addition, convictions of DUI-SBI and DUI Manslaughter come with a minimum Drivers License Suspension of three (3) years. All Florida DUI cases are serious, but when charged with DUI Serious Bodily Injury or DUI Manslaughter -- you need a legal team fighting for your rights who will investigate all technical, legal and substantive rights you may have. Many times times, in serious criminal DUI cases, early intervention by our Palm Beach attorneys can make all the difference in a defense. Usually, DUI-Fatality investigations by Florida Highway Patrol or local law enforcement or DUI Accident investigations may take several days or weeks to complete. During this precious time, our attorneys can be working behind the scenes, collecting information to not only keep you out of jail if you are charged, but to undermine the State's case to prevent charges from even being filed. For example, if a blood draw was completed, an investigation of the procedure of the blood draw, the quality of the blood sample as well blood storage is imperative to build a case to get these blood results excluded from your case. In addition, the State must obtain a subpoena if they want access to the level of substances in your medical records and lab results, if you were injured in the crash. You have the right to fight to have the judge quash that subpoena, and will want competent counsel on your side. If you have been charged with a Palm Beach DUI Serious Bodily Injury or DUI Manslaughter call us TODAY, to allow us to start investigating your case immediately.